Carol Simmons and Rebecca Watkins are sharing the fruits of their recent collaborative work with you! 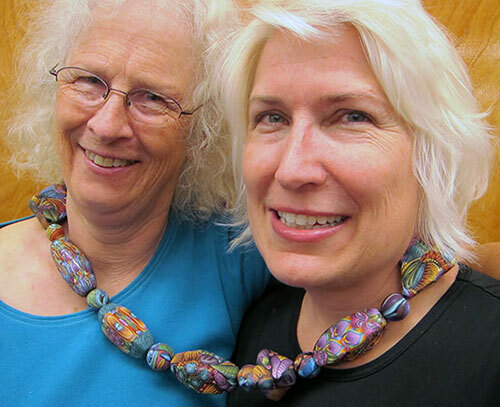 Carol wanted to experiment with big polymer beads and Rebecca wanted them lightweight and textured. Rebecca came up with an ingenious solution to make them hollow. Paper! Since paper’s burning point is 451° Fahrenheit, it works as an armature for polymer. Rebecca researched and redrew various shape templates, printed them onto cardstock, cut them out, and taped each shape together. The constructed forms were covered with a thin layer of polymer (see the black forms in this picture) and baked. 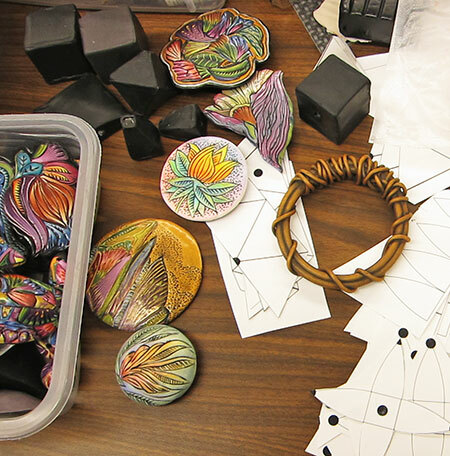 Carol and Rebecca covered the baked forms with slices of kaleidoscope canes. Rebecca incised deep lines into Carol’s densely patterned canes. They tried a variety of methods – deeply or lightly textured, highlighted with dark powder (see Rebecca’s project in Polymer Clay Global Perspectives) or not, covered in sheets of pattern or with small sections. Each test bead was then rebaked. Here are her shape files for you to download free, print and play with. “They are free because I did not invent geometry!” says Rebecca. Still, it was generous of the duo to share their secrets. Thanks to them we have another great way to create hollow forms with polymer. So generous. So clever. Thanks to you! The minute I saw Rebecca cutting them out, I knew they would be a global sensation. Now the fun begins as we watch them spin around the world. A genius idea Rebecca, thanks for sharing. This is one of those “light bulb” moments that will spark hundreds of spin-offs. How lovely of Rebecca and Carol to share their collaboration with us all. Thank you! Fantastic Idea !!!! Thanks for sharing, can’t wait to try it !!!!! See what happens when two geniuses get together? I love the polymer world!! Now that’s brilliant. And I can’t wait to play with this! Thank you so much for sharing, Cynthia. Fabulous! Thanks for your generosity and creativity. Well HECK! I have made boxes with that design for years to hold pens and other things for gifts. Never thought about them as armatures before! SOME people are SO Smart!!! Thanks for putting your geometry ideas on paper and sharing them with us. I’ve printed mine and am ready to play! How do we get the paper form out? I’m trying to visualize that step in the process. Thank you. Good question. You don’t! You leave it in. Thanks for saving all of us time and brain cells!! !lol Appreciate your generosity and skill…………….grin/ Definitely will play with these………. This idea is GENIUS!!! I cannot wait to try it. Thank you to Carol & Rebecca for sharing this technique. Oh, this is going to be SO much fun! Thanks so much for sharing the brilliance. Not sure if I’ll make the beads, but it never clicked that I could use card stock as an armature. Takes out the weight, opens up the inside…cogs are spinning! Why do these things come along when I have the absolute least time to play with them? Thanks for the inspir-straction!!! who you just invented my new favorite word…inspir-straction! So cool! I’m going to play with this. Thanks for sharing! Oh, and may I add that the beads that came from this collaboration are absolutely amazing! Beautiful work Carol and Rebecca! So ingenious!! Thanks for sharing. The geometry is discovered already but nobody has thought about this possibility before you! I tried yesterday and made a “long bead” and covered it with slices of my favorite canes. The result is light and elegant…. Thank you for sharing this simple and efficient idea ! Fabulous and efficient idea ! Fabulous idea! And i was just thinking anout making some big beads@ Can’t wait to try it! lost my job last year of 20+ years no severance or unemployment. am trying to survive by making jewelry. i am grateful for your FREE tips. helps my mind go towards creativity when i see little genius bits like this, gets the creative juices flowing. Thank You Very Much-God Bless! Thank you so much for sharing? ?